The upcoming 5G specifications from 3GPP, to be available in 2018, will include LTE-Advanced Pro as well as a new 5G radio-access technology. 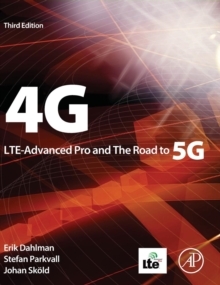 This practical and very successful book, written by engineers working closely with 3GPP, gives insight into the newest technologies and standards adopted by 3GPP, with detailed explanations of the specific solutions chosen and their implementation in LTE, LTE-Advanced, and LTE-Advanced Pro, as well as providing a detailed description of the path to 5G and the associated underlying technologies. This edition has been thoroughly revised and updated to reflect the large extensions to LTE as introduced in 3GPP Releases 12 and 13 and the role of LTE in the upcoming 5G era. New to this edition includes updated content on: 4G and 5G Radio Access Spectrum for 4G and 5G Machine-Type Communication Device-to-Device Communication License-assisted Access Full-dimension MIMOSmall-cell enhancements, eIMTA, FDD+TDD aggregation, dual connectivity Requirements on and general structure of 5G wireless access, addressing the existing and new usage scenarios for 5GTechnical solutions for the new 5G radio-access technology The authors of this book all work at Ericsson Research and have been deeply involved in 3G and 4G development and standardization. They are leading experts in the field and are today actively contributing to the standardization of 4G and 5G within 3GPP.